Our story begins in Ohio, at Oberlin College. A busy college conservatory hallway, where deep-thinking coeds bustle past, discussing music theory and other heady ideas. In walks a young woman from Greensboro, NC, named Rhiannon Giddens – tall and dark-skinned, high cheekbones, a playful, thoughtful look in her eye, an opera major with a particular affection for Jane Austen. She spots a flyer that advertises a party where attendees can participate in what she takes to mean “English country dancing.” Eager to experience what the pithy characters in her favorite novels did, the student goes to the party and discovers that’s not it at all. It’s a contradance – an old New England tradition that integrates both English and French dances, among other things. But she has so much fun that, soon after that outing, the opera singer is calling contradances in her spare time, hanging out with old-timey pickers, learning about Celtic folk music and how to saw a fiddle and pick a banjo. Indeed, much of Giddens’ career since crossing from opera to folk has been a dance – she’s moved from partner to partner, picking up steps along the way. Her most recent spin sees her pairing with renowned Americana producer T Bone Burnett for a delicious soup of a record named Tomorrow Is My Turn, after a Nina Simone song that Giddens slays with cinematic attack halfway through the disc. It’s an interesting leap for those who know Giddens only as one-third of the Carolina Chocolate Drops. But there is so much more to the story than simply a leap. The auditorium at Appalachian State University in the mountains of North Carolina was far from empty in 2005 when a young multi-instrumentalist from Phoenix, AZ, named Dom Flemons walked through its doors. Tall and striking, with glasses and a thoughtful gaze, he must have been even harder to miss then than he is now. Flemons was strolling along the campus with his buddy Sule Greg Wilson of Tempe, AZ, blissed out on the glory of the experience. After all, American folk music gatherings and festivals tend to be pretty whitewashed affairs. At that point, four years after O Brother Where Art Thou raised mainstream eyebrows toward the fringes of a still-simmering folk song revival, Americans were under the impression that pickers like Pete Seeger and Earl Scruggs made the banjo what it was, all but clueless to the instrument’s African origins. But here, on the campus of App State, was the Black Banjo Gathering – a crowd of players who knew deeper bits of American folk music history. They gathered here because of the instrument’s origins, to rediscover and reclaim their piece of the folk legacy. As the gathering came to a close and real life recommenced, Giddens, Flemons, and Wilson gathered back in Wilson’s garage in Tempe to jam a bit and share some songs. They recorded a demo and popped it up on the internet, where sorely little was available for anyone looking to learn about the intersections between African-American traditions and American folk music. “There wasn’t even anything on stuff like minstrelsy or anything like that,” Flemons remembers. “Anything that was involved with banjos and black people, all that documentation was in the fringes, in books that people hadn’t referenced in years. What we ended up doing was… Rhiannon and Sule and I wrote out several very strong pieces of articles that we found in our own personal research and put [on the internet] a basic idea of what black stringband music represents to American culture.” The groundwork for what would become Flemons’ and Giddens’ mission for the next decade was thereby laid. With Wilson, the trio took to calling themselves Sankofa Strings, for a Ghanaian phrase that translates loosely as “reach back and get it.” Indeed, nothing could better summarize their allegiance to yanking black stringband music into the 21st century. As time passed and Flemons and Wilson migrated to Giddens’ home state of North Carolina, they developed a habit of showing up in support of Giddens’ old dance partner, the aging and storied North Carolina fiddler and songster Joe Thompson. But, the umbilical pull of life and family drew Wilson back to Arizona, leaving the two remaining Sankofa pickers looking for another avenue. Considering the trajectory of black stringband music at that time, neither Flemons nor Giddens could have predicted what would come next. What happened was that the trio quickly became quite a bit more than just folk-famous. Their first gig was at the National Folk Festival, then it was on to stages around the world. Sold-out shows in their home state of North Carolina felt like giant house parties. There were – and are – things the Carolina Chocolate Drops can bring to stringband music that aren’t being brought from any other comparable band on the scene. That is, if there even is a comparable band on the scene. At a time when folk-rooted bands like Mumford and Sons have inspired countless knockoffs, one would be hard-pressed to find artists hoping to ride the CCDs wave. Part of that is because their music rests on the firm foundation of Thompson’s life and legacy; part of it is the sheer magic combination of the three founding players, whose musical knowledge and instincts span the entirety of the American musical vernacular: ragtime banjo, studious opera, urban beatboxing, and beyond. What audiences perhaps saw and felt was relief that American folk music isn’t just a white man’s tradition. What musicologists got to experience was the excitement of seeing untapped areas of American folk history revived and reintroduced to contemporary audiences. Meanwhile, behind the scenes, Giddens and her bandmates struggled against the frustration of ongoing stereotypes – something they viewed as persistent holes in the awareness of American musical history – paired, no doubt, with a little old-fashioned American racial ignorance. Despite the pervasive and unignorable lack of awareness among audiences about the role people of color played in the evolution of American folk music, Giddens, Flemons, and Robinson managed to carve a space for themselves in a new wave of folk music revivalism that did exactly as Giddens says – it got race out of the way so that three of the most gifted music-makers in contemporary stringband music could revel in their exceptional chemistry. And, for anyone who ever saw the original trio play live, it felt as though all three of them were playing with the same body. But, as often happens when bodies grow, the seams started to stretch beyond their bounds and the players in the Chocolate Drops started to buckle under the tension and discomfort. Flemons explains, “We kept changing personnel for the group and I wanted to put a stop to it. After Justin left, it should have ended there. But [we tried] to keep it on … . It was probably the best gig that any of us might do. Folk music isn’t a great-selling genre of music. The fact we were able to get so far as a group was amazing. We did a lot of amazing things together as a group.” He goes on, careful to be honest with his view of the band’s story while honoring the fact that he devoted his life to a project – and two collaborators – that he continues to view as one of the most remarkable things he’s been a part of so far. As untenable as the tensions between the band’s co-founders may have become (Giddens declined to comment specifically), both Giddens and Flemons recognize they couldn’t have built the careers they have without one another. “Rhiannon needs somebody to bounce off of to get her riled up to sing the way she needs to sing,” Flemons says, frankly. “It’s something that’s been a very interesting part of our relationship as a musical duo. She’d use me as the person to be angry at so she could get her spirit up, so she could sing really well. On my end, it’s always been a fight with her. But she’s a beautiful woman. … There was always a notion that the mainstream was going to come in and want her voice. That was always the plan, too. We always wanted to lift everybody up. It was only a matter of time before Rhiannon turned around and said ‘I don’t need you guys. These guys are telling me something better and I’m just going to go with them.’ And that’s what she did. 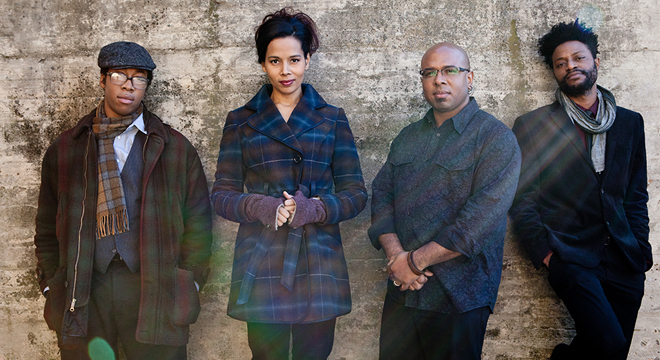 Even as internal tensions rose and confusion mounted about who was in charge, what direction the band was headed, and who exactly was in the band, Giddens remained determined to keep the Carolina Chocolate Drops relevant. Yet somehow, even in the midst of delving deeper into the history of black stringband music in America – in pulling the “Sankofa” tradition forward: reaching even farther back and getting it – Giddens found herself in the company of one of the most sought-after contemporary roots music producers at work today. She was introduced to T Bone Burnett by the Chocolate Drops’ former manager Tim Duffy. Duffy’s friend Taj Mahal was friends with some of Burnett’s friends. The whole story is as “industry insider” as one can get in the realm of folk music. But, the next thing Giddens and the Chocolate Drops knew, they were in the studio with Burnett, recording a track for the least old-time folky thing they could imagine: A Hunger Games movie. The film called for someone who could approximate what “traditional Appalachian music” would sound like in the future, making the CCDs an obvious choice. It was after that session that Burnett posed the question to Giddens: “What would your dream album be?” Ever the conscientious student, she started making a list of songs. Of his impulse to get Giddens into the studio for a solo album, Burnett told The New York Times last month: “It’s safer to be in a band. It’s good to have other people around her to absorb the blows. But in her case, it seems like she was being, I won’t say wasted, but underutilized. In the Bible it talks about hiding your light under a bushel.” Burnett tried to move that bushel away when he first enlisted Giddens for the Bob Dylan tribute album The New Basement Tapes, then pressed her for a solo recording. Despite the distorted guitar and dirty indie rock vibe that opens the song, its story falls precisely in line with Giddens’ career to this point. Though versions of the song have been laid down by more contemporary artists – and white guys – like Dex Romweber and C.W. Stoneking, the original version was one of a handful of songs a woman named Geeshie Wiley recorded in the 1930s. Little is known about Wiley’s life and career, though much – from whether or not she stabbed her husband to death, to what her actual name was – has been speculated. What is known is that she was an exceptional blues singer and guitarist who recorded “Last Kind Words” for Paramount Records in 1930. She recorded only four other songs in her career, but no doubt brought down every room in which she performed. Following Wiley’s lead, Giddens’ rendering of “Last Kind Words” throws down a gauntlet. Considering the history of the song, it’s easy to imagine the Chocolate Drops doing it some semblance of justice. But the space around the vocal that Giddens likely required for her performance of it is something that was probably only possible with a new cast of characters in the room. From one of Wiley’s great masterpieces to songs by Elizabeth Cotten, Sister Rosetta Tharpe, and Nina Simone, Tomorrow Is My Turn is a testament to the extraordinary music that women – and, notably, African-American women – have contributed to the genre. Considering her vocal power and onstage charisma, some might read it as a hubristic attempt for Giddens to cast herself among these giants, but Giddens knows where she stands in regard to those who have helped influence the course of modern music. No doubt, her experience in opera – filling the shoes of divas for whom the part was originally written, or who defined the role in countless ways generations before – equips Giddens to nod at tradition while finding the part of the dance where her unique rhythm brings something new to the floor. “They’re in my ear, of course,” she says. “They’re in my headspace. When I learn a song, I obsess about it for a while and then I put that recording away. Whatever comes through in my performance that was inspired by that is fine, but I just try to sing the song. If you start thinking [about how it’s been done before], you might as well forget it. I just try to sing the story. The concert’s real head turner was Rhiannon Giddens from the Carolina Chocolate Drops. She turned to the folk revival repertory of Odetta for the enigmatic “Water Boy,” singing it with the fervor of a spiritual, the yips of a field holler and the sultry insinuation of the blues. And she followed it with a pair of songs in Gaelic, making them peal and dance. These weren’t her local folklore; they were learned, and the performances were splendidly polished. Indeed, “Waterboy” is one of Tomorrow Is My Turn’s greatest accomplishments. The song is one of the most popular field call songs about water boys in folk music, but it has evolved into a song that reminds us of the history and foundations of racism in the US. Its lyrics accuse a water boy (the worker or slave responsible for providing water for those in the field) of stealing money from the pockets of his master. The lyrics are a testament to the power structure that drove slavery in the US and which, in many ways, contributes to the ongoing power structure here. A number of folksingers have recorded the song through the years, including The Kingston Trio. But the most iconic renderings until now have come from Harry Belafonte and Odetta. Belafonte’s version seems to take on the persona of the person in power who wants to whip the water boy for stealing money. There’s a prowling energy to it – Belafonte’s voice sounds like it’s peering behind trees and rocks, trying to catch the hiding water boy. It’s creepy and intimidating. Odetta’s rendering, on the other hand, gives one the impression that it’s being sung by the water boy’s mother, remembering in horror how her son was whipped, and for what. Both are haunting, uncomfortable renditions that might make one squirm in one’s seat from being faced with such inhumanity, unable to ignore that scenes like this played out on a regular basis during slavery’s heyday – that this is our shared history. Giddens somehow manages to straddle both Odetta and Belafonte’s versions, coming at this bit of history from the present day – a woman coming to terms with her inherited history. It makes sense, considering she is a successful mother of two at a time when she’s not necessarily in danger of being lynched or abused for speaking out. But the fact that her children are growing up non-white in America during a time when police brutality is in the spotlight makes history’s persistent implications something from which she is not yet free. So, in true Sankofa fashion, she reaches back and gets the song, gets the history, and sings at it with all the energy of a woman – of a mother – who’s had enough of the legacy of racism in America. For her part, Giddens is trying to let current events seep into her music indirectly for now. Whether or not the high-profile stories of police brutality in the mainstream news the past few years were what she specifically had in mind while recording songs like “Waterboy,” Giddens feels it’s her responsibility as an artist to know what she’s doing before she addresses these turns of history directly. Still, the album releases at a time when these stories are raw in the minds and hearts of many listening. It matters that an African-American woman took a turn in her career to pay homage to the underheard and underappreciated women who laid the groundwork that allowed her to succeed in the first place. Whether or not Giddens (or Burnett) handpicked “Waterboy” to comment on these events, the resonance and timeliness is difficult to ignore. Even though “Waterboy” is an exquisite – and relevant – showcase for Giddens’ vocal performance, it’s not the only stunner on the disc. While the album opens with the all-but-forgotten song of Geeshie Wiley, that tune is followed by a nod toward one of the most famous women in country music: “Don’t Let It Trouble Your Mind” was a medium-sized hit for Dolly Parton in 1969. And, while it’s tempting to read the disc as an exercise in black feminism, Giddens and Burnett peppered it with gems like this folk revival-era tune. Then, as now, women in country music were not expected to be so plainspoken and direct. But, time would show that Parton’s straightforward honesty was her greatest asset. “If you don’t love me, leave me, and don’t let it trouble your mind” preceded “I am woman, hear me roar,” and phrases like “A woman without a man is like a fish without a bicycle” by a few years, but Parton’s Tennessee mountain feminism was no less stirring in its context. It shows. For all the color and tone she nails in each song, the most compelling thing about Giddens’ voice is how it displays vulnerability as well as strength. A lesser artist would just lean into its power and march forth without hesitation. But what will be Giddens’ saving grace is her willingness to take these risks – from letting the Chocolate Drops evolve to striking out on her own with a list of songs and some crossed fingers, Giddens has proven herself an artist worth watching. Like Flemons said, it was only a matter of time before the world would come looking for her voice. Whatever she’s learning over there in the deep end, we can all be grateful that Giddens pinched her nose and jumped in. Lead photo courtesy of Big Hassle. Giddens is on tour throughout the spring.